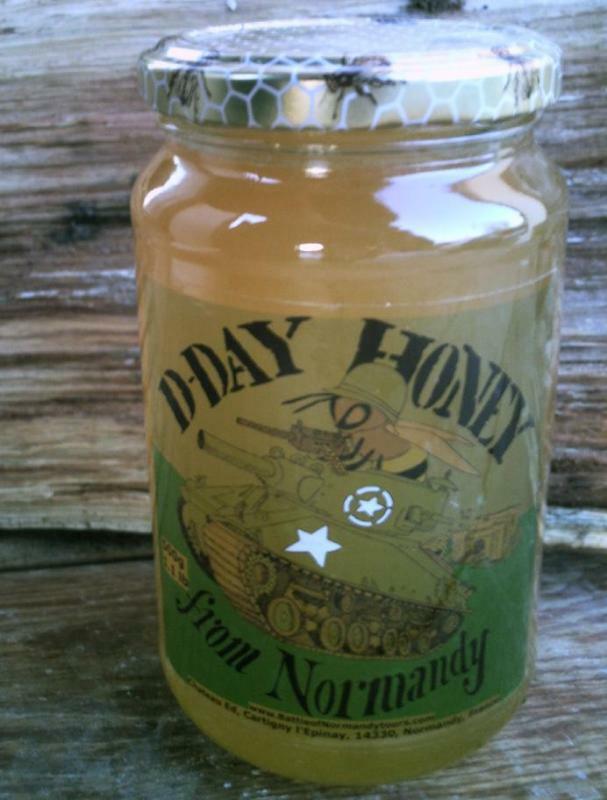 Honey made by bees here in Normandy in the village of Cartigny l'Epinay, about two kilometers (one and a half miles) from the site of General Eisenhower's first Supreme Headquarters here in France and twelve miles south of Omaha Beach. 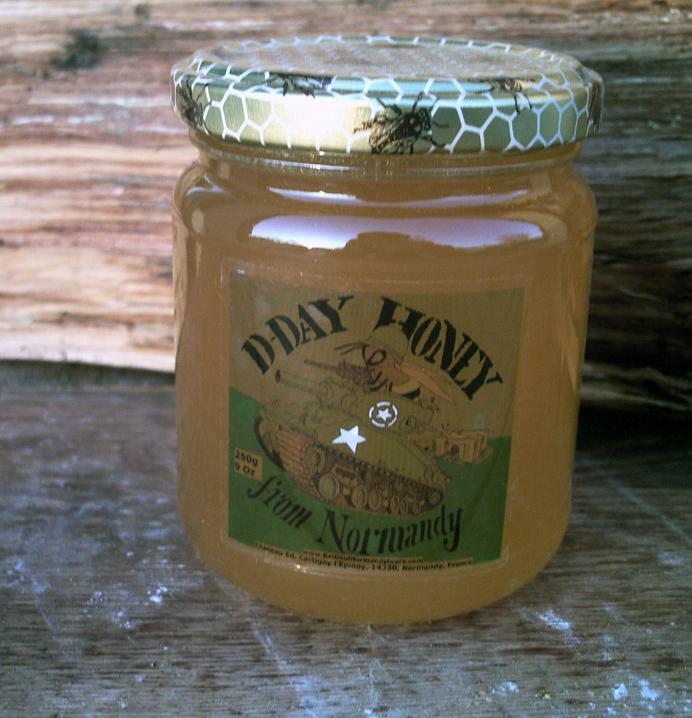 This honey contains no additives or preservatives, simply being extracted from the comb, strained and bottled. You might be able to see what appear to be very small grains in the honey- this is pollen and can be eaten (pollen is actually very good for you and tastes really nice). 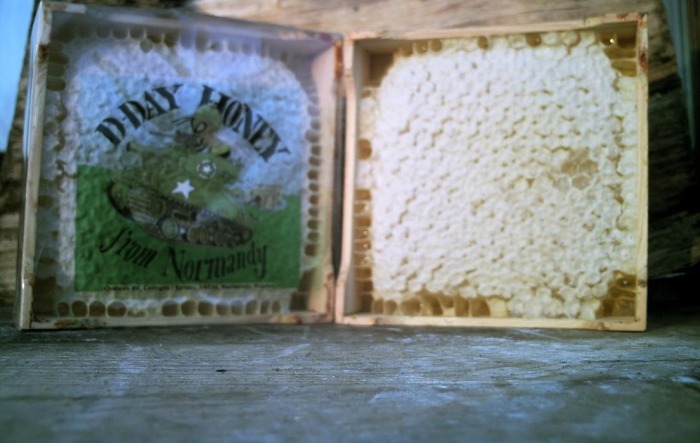 In the sections of Honey, the only bit not to eat is the wooden frame. Apart from that the honey and wax can be eaten together. The honey is sold in Jars of 250 grams (nine ounces) and 500 grams (one pound two ounces) and sections of honey eleven cms (four inches) square and five cms (two inches) thick weighing 450 grams (1 pound). Bees don't have a fridge in the hive with them, yet their Honey keeps for years. If you put your Honey into the fridge it will crystalise (separate out into sugar and other constituents) and not taste particularly nice. Just keep your Honey in the jar in a cupboard in the kitchen. Even after you have opened the jar it will still keep at room temperature for over five years. Even if you never put your Honey in the fridge, it will most likely crystalise at some stage. This is a perfectly normal happening for natural Honey and is a good sign that it is pure. 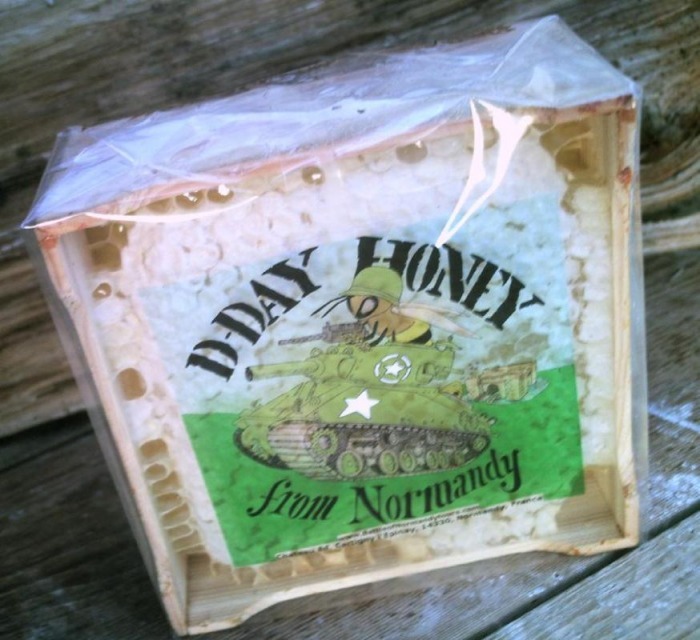 Most commercially produced Honey has additives in it specifically to stop it crystalizing. If your Honey does crystalise (separate out into sugar crystals and other constituents), it is very easy to liquify it again. All you have to do is gently warm the jar for about half an hour to forty minutes by heating it in a saucepan of warm (not boiling) water. But it can be as simple as leaving a jar of crystalised Honey on the window-sill in the sunlight for the afternoon on a warm day as this will normally re-liquify it. The other ways can be to gently warm the jar for a few hours by putting it beside (not on) the hot water boiler or leaving it on a warm radiator. It is a bad idea to heat Honey directly and don't overheat it (no higher temperature than about 50 centigrade (140 Farenheit)) as it will burn. And finally never, never put Honey in a microwave oven. 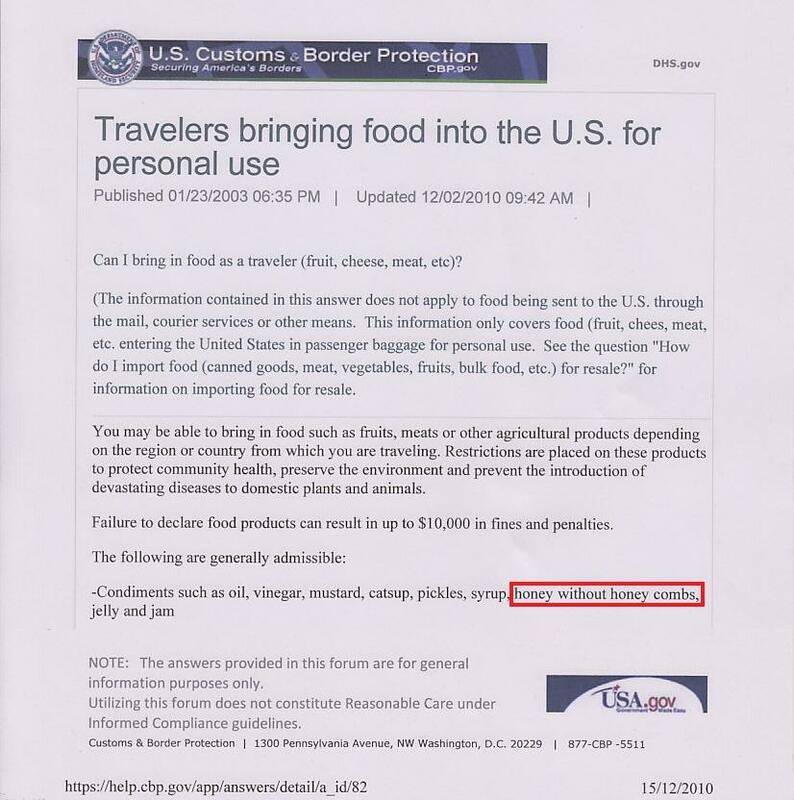 -Honey- comb honey, royal jelly, bee bread, or propolis if it is not intended to be fed to bees (USDA Miscellaneous and Processed Products Manual, Table 3-100)"
"Failure to declare food products can result in a $10,000 fine". You are also not allowed to bring liquids into the cabin area of an aeroplane now, and Honey counts as a liquid, so make sure you wrap it up well so it won't break and pack it in your hold luggage for the flight home. Don't try and take Honey into the cabin as carry-on luggage!!! TSA Homeland Security will confiscate it as it's a liquid!!! 1) Pack your Honey in the luggage that will travel in the hold of the Aeroplane. 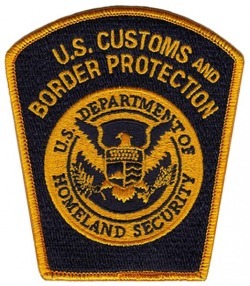 Do not Pack your Honey in your carry-on luggage!!!!! 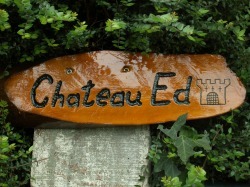 It's very easy to post your honey home and it's safe if well wrapped in newspaper in a cardboard box. All you need to do is wrap the jar in newspaper and go into a French post office. There you can buy a small, strong cardboard box that is on sale in any French Post office at a fixed price of about 5 Euros, Box and Postage costs both included in that price. Put your wrapped jar in the box, address it and give it to the post office clerk and he'll post it off. If you do one of these two things there should not be any trouble. Don't eat it all at once! 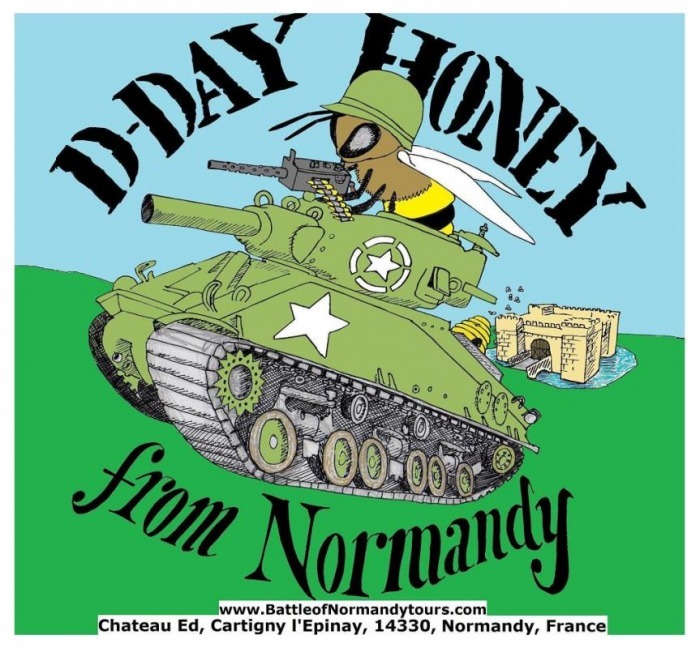 The following article about D-Day Honey was written by Gary Lee Kraut for the online magazine "France Revisited", with the same article also published in the online Magazine "N4Normandy"